Bust: 33 (37, 41, 45, 49)"
A fashionable and functional tunic that can be worn on its own or used as a layering piece. A unique hem and pretty yoke detail will make this piece a favorite in your wardrobe. Anna Cohen attended FIT in New York and Polimoda in Italy, graduating with a Fine Arts degree in International Fashion Design, and went on to design for some of the top designers in the apparel industry. A pioneer in sustainable fashion, Anna launched her namesake ready to wear apparel collection in 2005 to critical acclaim, garnering awards and press in the United States and abroad. 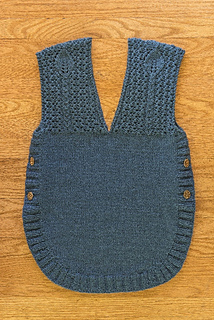 She began working with the Imperial Stock Ranch (Imperial Yarn) in 2008, helping to develop knit and woven textiles, and hand knitting patterns – like this one.